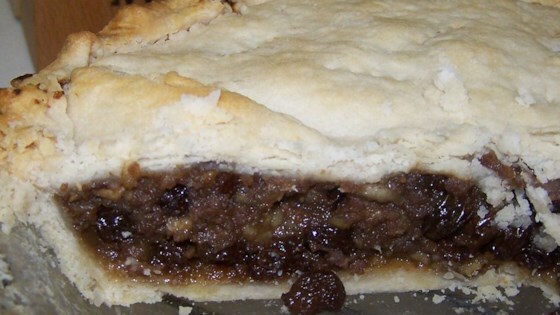 "An old-time delicious mincemeat pie filling. I have frozen this filling in zip-lock baggies, since I don't use a pressure canner. Apple cider can be used in place of brandy if preferred." In a large skillet over medium heat, cook the ground beef thoroughly. Being sure not to over-brown it. Place chopped apples and the cooked ground beef in a food processor and pulse until the mixture is made up of pea sized chunks. In a non-reactive skillet combine the apple and ground beef mixture with the raisins, brandy, ground cinnamon, ground allspice, ground nutmeg and the white sugar. Simmer for 30 minutes. Cool filling to lukewarm and pour into freezer bags (2 cups per bag). Freeze filling until needed. One baggie will fill one 8 inch double crust pie. Thaw filling before using. I made this for a Victorian Christmas for six people, and two of them liked it so much they fought over who got to take the leftovers home. It's perfect for any get together! just watched a Victorian program on BBC making mincemeat for pies and contrary to a review of this recipe, it contained boiled beef. The best mincemeat I ever made had tinned sour cherries in it. used this recipe at christmas time. all relatives loved it. kept very well for days after.